I see gold going lower and lower eventually breaking below the psychological figure of $1,000 and perhaps even testing the $850 level to break the back of gold bugs and get the CNBC cheerleaders to claim the gold bull dead. The above introductory comments are edited excerpts from an article* by Doug Eberhardt (buygoldandsilversafely.com) entitled Is Deflation Still A Threat To Gold?. The Fed doesn’t like this [lack of circulation] but even putting interest rates to zero won’t force consumers and businesses to spend. 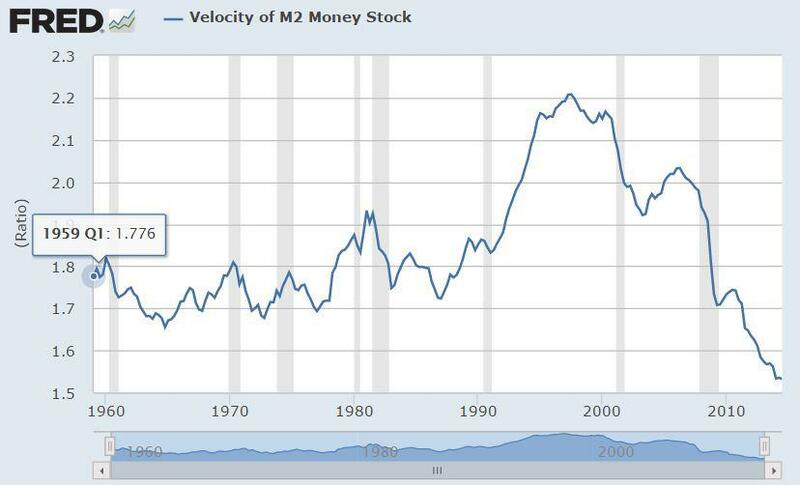 We have not seen this much of a decline in velocity in the 54 years that the Federal Reserve Bank of St. Louis has provided the chart presented below…This is a modern day unprecedented issue the Fed is fighting and is a possible precursor to more QE down the road if necessary to get money moving (inflation target of 2%). 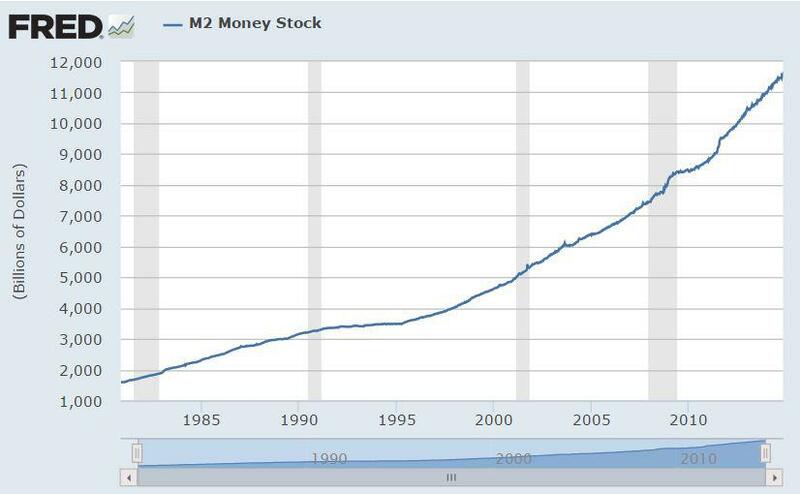 When Bernanke was Fed Chairman he was very clear in his 2002 speech Deflation: Making Sure “It” Doesn’t Happen Here what the Fed would do during deflation…and there is no doubt in my mind that the Yellen-led Fed would implement more QE if interest rates started to shoot up past 3.06%. The financial media keeps telling us the economy is moving along just fine and higher rates are coming based on the fact the Fed says higher rates are coming but what does the price action of rates show us? Interest rates are still low. The 3.06% rate mentioned above comes from the high of the last 12 months reached last year. A decline of .02 on the 10 Year Treasury Note was the reaction for interest rates today despite the better than expected PPI report. While we will get bounces in various commodities from time to time, like natural gas of late with the onslaught of winter snow hitting 50% of America earlier than expected, they are still mired in deflation and the Fed just can’t see it. 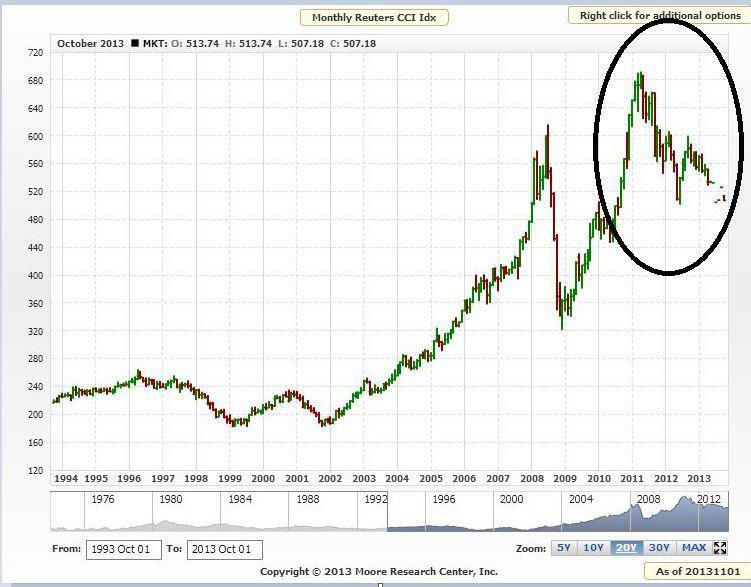 Have you seen commodity charts since 2011? Below is a chart of the Continuous Commodity Index (CCI)…[which] is the CRB index in its original equal weight form from 1957. One cannot consider higher college tuition costs or government health care-related prices being higher inflation related, because anything the government guarantees in price gives the companies doing the selling carte blanche to raise prices. Japan and Europe had worse than expected data come out this week. Economic data showed the Japanese economy in the last quarter contracted fueling hopes of more stimulus or a postponement of a sales tax hike due next year. The IMF came out last week and said that the euro zone growth could be worse than expected. 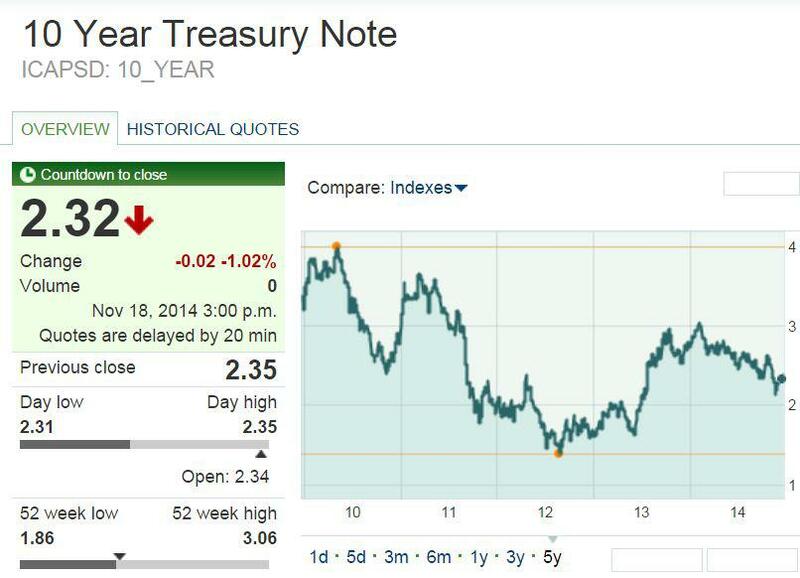 Does the Fed not see that this could have an effect on the U.S.? Are some of the M&A deals offsetting the fact that American industrial production declined? Is the stock market possibly overvalued or does price action trump everything and follow the trend higher with stops? The trend is your friend and it sure hasn’t hurt those with 401k’s. and you can add a stock market that keeps money moving towards it rather than a beaten down asset like gold. One can not ignore the above. My advice is to still dollar cost average into a position in the metals. While many utilize ETFs… to play the metals I think an investor should hold the real thing. Some may say that is because I sell the physical for living, but when you analyze the prospectus and see that these ETFs are not insured and the other problems associated with them, I view them only as trading vehicles. Happy Thanksgiving Day to all those that celebrate it! I believe that we are seeing a global effort to use paper trading (aka Naked Shorting) to move the PM prices downward which is allowing the really large investors and the Countries they control to acquire physical PM’s at low prices. Lets use China as an example, they hold tons of Gold so they can easily use naked shorting, since if they get “caught” they can always simply give up some of their physical Gold. This allows them to use their physical PM’s as “leverage” to move PM’s to their own advantage. In another example, they could decide to “dump” enough US$ to make up for any loses they have, which would then probably make the prices of PM go up (as compared to the US$). Sooner or later, some combination of events will cause physical PM’s value to start increasing rapidly and when that happens all those still holding paper PM’s will be unhappy to say the least.